This course is one of our trilogy of foundational courses designed to introduce you different aspects of working with clay. The other two are our unique Slow Clay Wheel and Form & Surface hand-building courses. It does not matter which of the three you start with, once you become a student with us you have priority to continue with us and move into a different course each term until you have completed the three introduction courses. Thereafter, you can continue to develop to a high level in one area if you wish. Content: Our Porcelain Small Objects course is suitable for anyone who wishes to experience the unique properties of porcelain, a dense, white clay which has similar properties to glass. Learn to make unique and personal Porcelain Small Objects and Wearables with award-winning ceramic artist Pilar Rojas who has created this unusual 8-week course especially for Slow Clay Centre. It’s a course designed to enable you to make your own porcelain wearables and small objects based on your individual designs. This is not a “cut & paste” workshop! It is rare chance to experience a structured design development course and an introduction to porcelain through unusual skills and inventive techniques from an experienced ceramic artist. All levels welcome and suitable for beginners! Pilar provides plenty of practical demonstrations and shares her extensive knowledge and experience as a professional artist using porcelain. Students will learn a range of techniques from laminating and inlay of coloured clays to drawing and carving the surface. Pilar’s expert advice is on hand at all times. All participants are carefully guided through the design process to ensure a personal outcome focussing on individual responses and directions of personal choice. Fee: $508 Earlybird and conc, $535 Normal (50% deposit required to book) The 8-week course fee covers the use of porcelain, all other materials and even includes firing fees! Optional silver clasps etc will be an extra surcharge paid direct to the teacher in the final class depending on individual use. Size Limit: Due to the nature of porcelain the size of your objects must be limited to 10cms cubed. 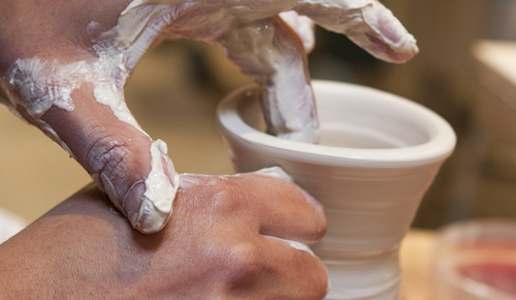 Note: Studio Access Times (SATs) are not available to Porcelain students.